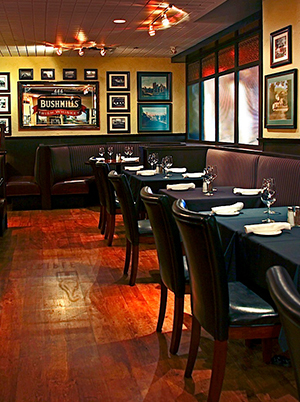 At home in the Financial District’s Sheraton Centre Hotel for the last five years, Quinn’s is a family owned and operated business that boasts the very best in Irish and North American cuisine. Whether you choose to indulge your senses with slow-roasted prime rib, Irish stew, fresh Clare Island salmon or our signature premium AAA Alberta aged beef steaks, your dining experience will be one to remember with all food made on site. The magic of your next meal, corporate or social event is complete in either our main dining area – with its spacious booths, private meeting rooms and cocktail reception areas – or at the stunning copper-topped bar and upscale lounge, where the very best selection of 21 premium ales are on tap to complement an impressive of 240 brands of the world’s finest whiskeys. Flawlessly combining exceptional culinary expertise with outstanding service and an enchanting ambience, Quinn’s defines the very essence of Ireland’s centuries-old commitment to a level of hospitality that will not be surpassed.